This desire led to her pursuing a Bachelor of Science (BSc) degree at the University of KwaZulu-Natal. During her undergraduate studies, Ramnath realised she wanted to become a microbiologist. ‘I think having a passion and curiosity for your chosen field of study motivates you to continue studying further,’ said Ramnath. After completing her undergraduate degree, Ramnath went on to do her honours research where she discovered a novel bacterial species growing in the Sua salt pan of Botswana. This finding inspired and motivated Ramnath to pursue her master’s degree. After successfully graduating with a masters, she set her sights on undertaking her doctoral studies. In her research Ramnath investigated the microorganisms present in Eucalyptus wood (used to produce pulp and paper) and determined how one could use enzymes produced by these microorganisms to benefit the wood pulp industry. ‘The use of microorganisms and molecular techniques has infiltrated every avenue of science imaginable, making it a very diverse and interesting field to be in. Especially at this time in our earth’s history, with the effects of global warming and pollution, we are always striving to reduce our carbon footprint and preserve the planet as best we can. Turning to green energy and bio-processing may be our salvation. Microorganisms may be small in size but they impact our lives in a big way, and on a daily basis,’ said Ramnath. Ramnath’s research allowed her to develop a specific cocktail of enzymes to degrade sticky deposits naturally present in the pulp. The sticky deposits reduce the quality of the pulp produced and cause the breakdown of machinery at the pulping mills, resulting in a loss of revenue. The method of enzyme treatment developed is an environmentally friendly and economical alternative to the traditional method of treatment which uses chemicals. Reducing the amount of chemicals used to treat pulp will reduce the amount of waste generated by this industry. In addition, if the wastewater is treated appropriately, it may be recycled back into the mill, thus reducing this industry’s dependency on municipal water. 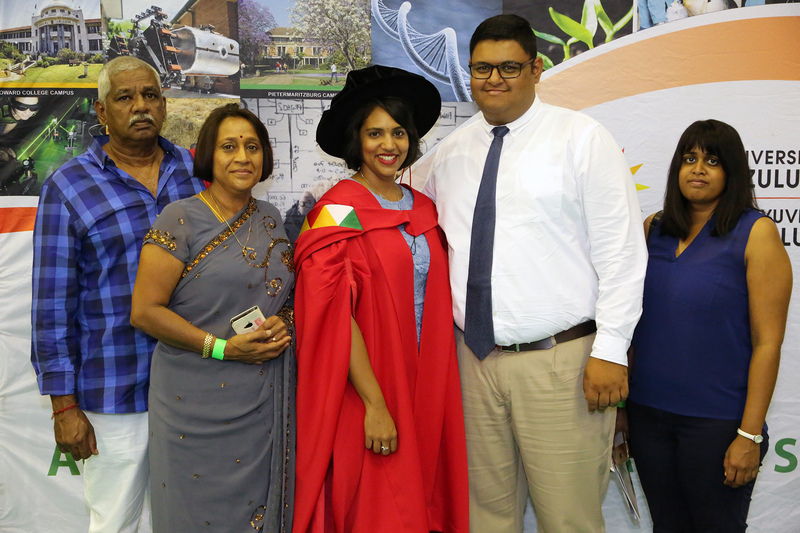 Ramnath, is currently a postdoctoral research fellow at the South African Sugarcane Research Institute (SASRI) in Mount Edgecombe where she is looking at molecular breeding of sugarcane for commercialisation. ‘SASRI is one of the world leaders in sugarcane research and I am excited to be a part of it,’ said Ramnath. Ramnath expressed her gratitude to the National Research Foundation (NRF) for supporting her throughout the postgraduate studies. When Ramnath is not researching, she enjoys baking, reading, travelling locally and internationally.